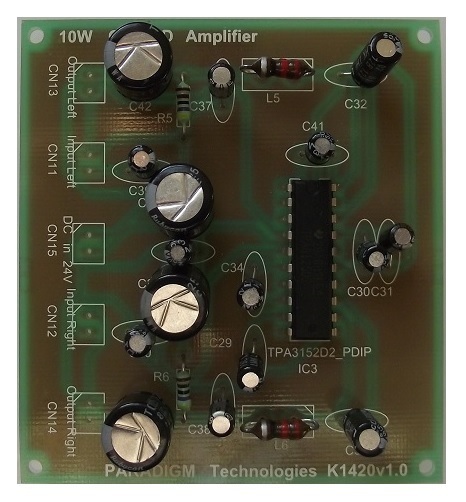 The kit uses a TPA3125D2 stereo audio power amplifier that is capable of delivering up to 10W per channel of continuous average power into a 8Ω load at 10% THD+N or 8W per channel at 1% THD+N. The gain of each channel is fixed at 20dB. This kit uses the 20-pin thermally enhanced DIP package (NE). Paradigm Technologies have designed a fully symmetrical PCB around the TPA3125D2 chipset to ensure that maximum performance is obtained.